The department store has long been the go-to beauty haven for consumers looking to buy cosmetics, skincare and fragrance. We question their enduring reign, in light of exciting new entrants into the space, both on and offline. Department store retailers pride themselves on delivering a market leading beauty buying experience; the glamour and shine of the beauty offer dominates the prime threshold space. Whilst continuing to grow their beauty sales, however, recent data suggests that department stores are losing overall share (Bloomberg Analysis, 2016). We have seen the likes of Debenhams, John Lewis and Harvey Nichols investing millions into renovating their beauty halls, but will this be enough to defend their position? In our opinion, creating a compelling customer experience is a key determinant of whether a beauty sale is won or lost. While department stores win on range and choice, the best beauty brands are looking to offer a differentiated, on point and consistently good experience across multiple channels and touch points. If they want to maintain the draw, multi-brand retailers must recognise this, and continue to support their brands in curating an attractive and engaging environment for shoppers. 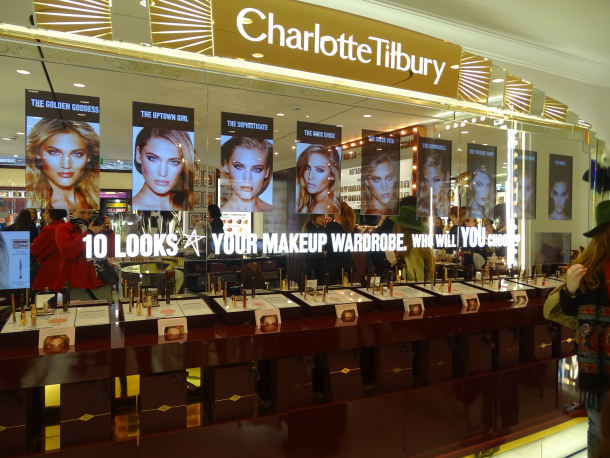 Charlotte Tilbury, which originally launched in Selfridges, made the move into stand-alone retail with the opening of two branded London stores. Bravely competing with the high-end destination retailers such as Harvey Nichols and Harrods, this challenger brand has achieved success by providing a superior customer experience in its own-brand retail environment. Tilbury has brought alive personalisation using clever technology and has created an intimate store experience that makes the customer feel comfortable, even at busy times. This carefully curated space has been crafted with the benefit of valuable customer insight to help understand shoppers’ desires. Coty (now the third largest beauty company in the world, having acquired P&G Specialty Beauty Business) entered a partnership with Younique, a peer-to-peer e-commerce platform which it invested in at the end of 2016. Younique has approximately 4.1 million customers in 10 countries and forecasts approximately $400 million in net revenues in 2016. This partnership will draw upon synergies from both parties; Younique’s high growth direct-to-consumer business combined with Coty’s manufacturing and supply chain capabilities, which will allow both companies to flourish. Leveraging user-generated content across this channel will be key to elevating the strategy to the next level, to drive the successful launch of its new brands to a wider demographic. We are in no doubt that creating a compelling consumer experience will drive future loyalty in the beauty space, whether it be through physical stores or partnering with new technology. It will be interesting to see how department stores react, and if they are able to adapt their offer to hold onto market share in the face of innovative competition.